The concept of ready-cooked food for sale is closely connected with urban development. 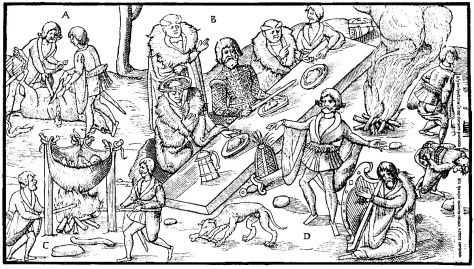 In Ancient Rome, cities had street stands – a large counter with a receptacle in the middle from which food or drink would have been served. It was during post-WWII American economic boom that Americans began to spend more and buy more as the economy boomed and a culture of consumerism bloomed. As a result of this new desire to have it all, coupled with the strides made by women while the men were away, both members of the household began to work outside the home. 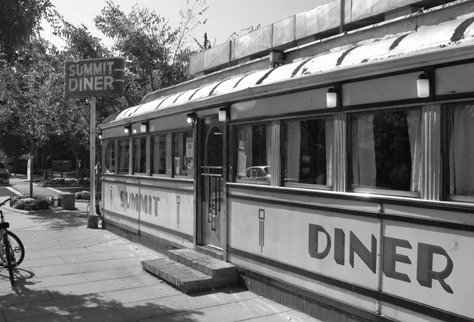 Eating out, which had previously been considered a luxury, became a common occurrence, and then a necessity. Workers, and working families, needed quick service and inexpensive food for both lunch and dinner. This need is what drove the phenomenal success of the early fast food giants, which catered to the family on the go (Franklin A. Jacobs). Fast food became an easy option for a busy family, as is the case for many families today. 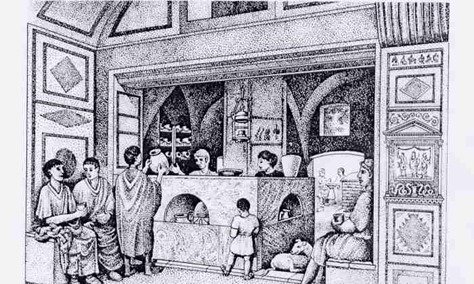 In the cities of Roman antiquity, much of the urban population living in insulae, multi-story apartment blocks, depended on food vendors for much of their meals. In the mornings, bread soaked in wine was eaten as a quick snack and cooked vegetables and stews later in popina, a simple type of eating establishment. 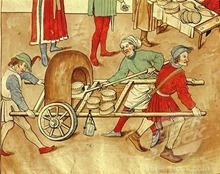 In the Middle Ages, large towns and major urban areas such as London and Paris supported numerous vendors that sold dishes such as pies, pasties, flans, waffles, wafers, pancakes and cooked meats. As in Roman cities during antiquity, many of these establishments catered to those who did not have means to cook their own food, particularly single households. Unlike richer town dwellers, many often could not afford housing with kitchen facilities and thus relied on fast food. Travellers, as well, such as pilgrims en route to a holy site, were among the customers. In areas with access to coastal or tidal waters, ‘fast food’ frequently included local shellfish or seafood, such as oysters or, as in London, eels. Often this seafood was cooked directly on the quay or close by. 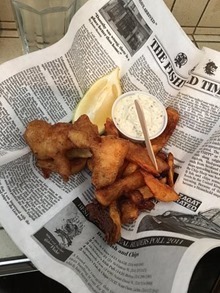 The development of trawler fishing in the mid-nineteenth century led to the development of a British favourite, fish and chips, and the first shop in 1860. A blue plaque at Oldham’s Tommyfield Market marks the origin of the fish and chip shop and fast food industries in Britain. British fast food had considerable regional variation. Sometimes the regionality of a dish became part of the culture of its respective area, such as the Cornish pasty and deep-fried Mars bar. The content of fast food pies has varied, with poultry (such as chickens) or wildfowl commonly being used. Since the Second World War, turkey has been used more frequently in fast food. The UK has adopted fast food from other cultures as well, such as pizza, kebab, and curry. More recently, healthier alternatives to conventional fast food have also emerged. 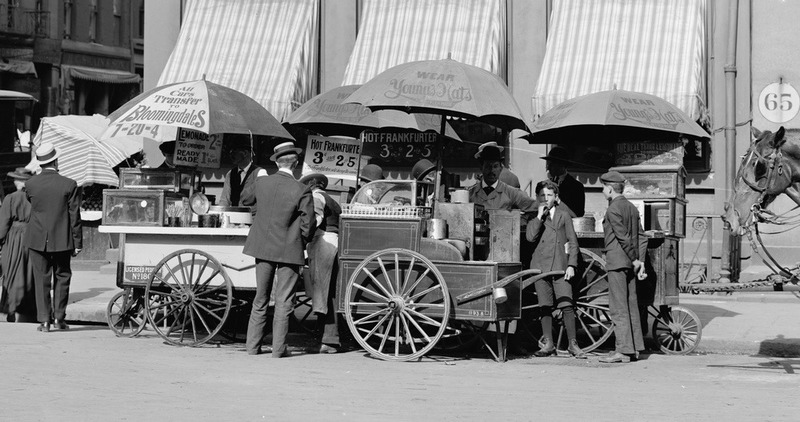 As automobiles became popular and more affordable following World War I, drive-in restaurants were introduced. 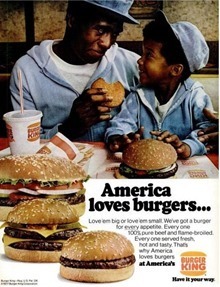 The American company White Castle, founded by Billy Ingram and Walter Anderson in Wichita, Kansas in 1921, is generally credited with opening the second fast food outlet and first hamburger chain, selling hamburgers for five cents each. Walter Anderson had built the first White Castle restaurant in Wichita in 1916, introducing the limited menu, high-volume, low-cost, high-speed hamburger restaurant. Among its innovations, the company allowed customers to see the food being prepared. White Castle was successful from its inception and spawned numerous competitors. Franchising was introduced in 1921 by A&W Root Beer, which franchised its distinctive syrup. 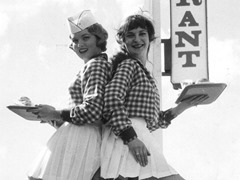 Howard Johnson’s first franchised the restaurant concept in the mid-1930s, formally standardizing menus, signage and advertising. Curb service was introduced in the late 1920s and was mobilized in the 1940s when carhops strapped on roller skates. The United States has the largest fast food industry in the world, and American fast food restaurants are located in over 100 countries. Approximately 4.7 million U.S. workers are employed in the areas of food preparation and food servicing, including fast food in the USA. Worries of an obesity epidemic and its related illnesses have inspired many local government officials in the United States to propose to limit or regulate fast-food restaurants. Yet, US adults are unwilling to change their fast food consumption even in the face of rising costs and unemployment characterized by the great recession, suggesting an inelastic demand. However, some areas are more affected than others. In Los Angeles County, for example, about 45% of the restaurants in South Central Los Angeles are fast-food chains or restaurants with minimal seating. By comparison, only 16% of those on the Westside are such restaurants.